What can be said about the cutest, littlest, strongest fighter in the entire world??? As nurses, we were so blessed to be a part of not only his life and fight, but the entire Kaat family. We, at Children's Hospital of WI in Milwaukee, had the great pleasure of helping care for Jaymun in his short three years here on earth. For anyone that had the honor of knowing Jaymun, you knew what a unique kid he was even from the very beginning. Although he battled with cancer on and off, he rarely showed it. He was always playful and smiling (except of course when he was getting that cute crazy hair washed!) He loved being a normal boy running around with his brothers and sister, getting dirty, jumping on the trampoline and just discovering everything wherever he went. While in the hospital, he was his feisty little self, and always made the staff smile (as seen in some of the video entries). All of the nurses would fight over him and try to get him as their patient for the day. We all had the pleasure and honor of watching Jaymun grow up. 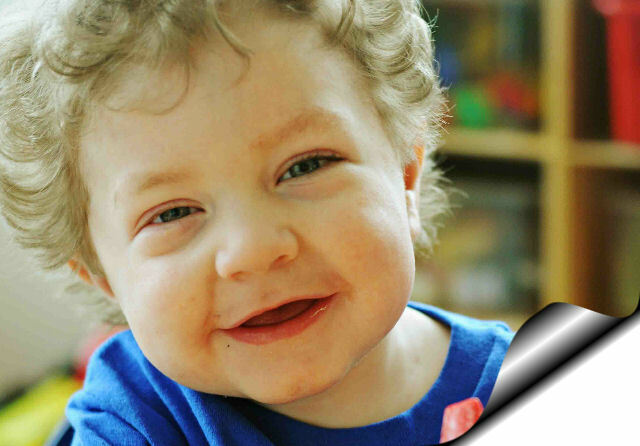 We can still picture that three week old baby receiving his first chemotherapy drug and smiling at us (ok, some say it could have been gas, but he melted us with that smile!) Jennifer did a fantastic job of raising that little baby in such a private and secluded area (a.k.a. a hospital room!!) She also dressed him soo adorable, instead of him staying in the hospital gowns all day. We remember his first Halloween, of course spent in the hospital ...he was Tigger. Let me tell you, he was the most adorable and lovable Tigger you could ever imagine. We don't think any of us will see Elmo or Thomas the Train and not immediately think of our precious Jaymun. As we walk the HOT unit at work, we can still picture him walking down the halls in his Elmo pj's and robe, riding the plastic playschool car. He of course would not have been the boy he was without the help of his loving and supportive family. We thank Jennifer, Dave and the kids for allowing us to become a part of their family, both in the hospital and out, and allowing us to post our thoughts and memories today. Their time and efforts in keeping their journals undated on Jaymun's website were a blessing to us all. We all were able to keep tabs on the Kaat family and not only read about stories, but watched videos of Jaymun which showed how much he enjoyed life outside of the hospital. We also want to thank each and every one of you... your support and actions have helped unspeakably by keeping Jaymun alive through this website and his foundation. Jaymun will always hold a special place in our hearts and will be missed so much. God could not have given Jaymun a better family to love him and fight so incredibly hard for his life.